This formulation contains Co-enzyme Q10 Pycnogenol and Jojoba oil in a pH balanced anti-ageing formulation to help prevent the appearance of fine lines and wrinkles. This formulation is Paraben Free. Dermatological studies have shown that Co-enzyme Q10 could reduce the depth of fine wrinkles, with improvements visible within 6-8 weeks. 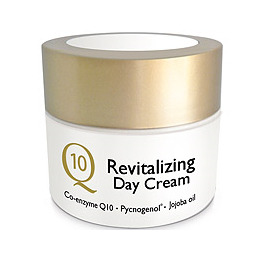 Co-enzyme Q10 and Pycnogenol are powerful antioxidants at the skin`s surface. This results in the reduction of free radicals and toxins, thus making the skin feel soft, smooth and revitalised. Co-Enzyme Q10 is a vitamin-like substance that occurs naturally in the body. It helps protect the skin from free radical damage and promote effective skin cell repair. 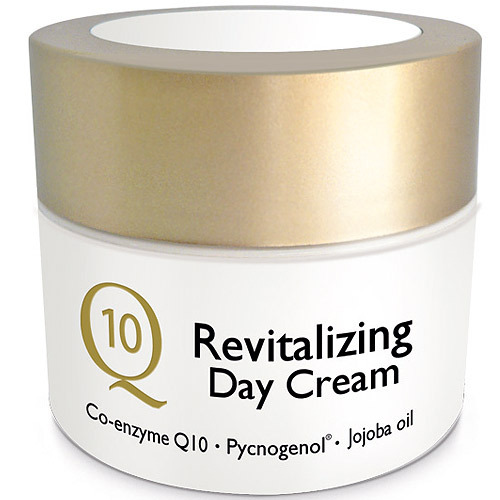 Dermatological studies at one of Germany`s leading skin care laboratories have shown that Co-enzyme Q10 could reduce the depth of fine lines and wrinkles over time. Aqua, Aloe Barbadensis Leaf Gel, Prunus Armeniaca Kernal Oil, Glycerin, Simmondsia Chinensis Seed Oil, Polyglyceryl-3 Methylglucose Distearate, Cetearyl Alcohol, Butyrospermum Parkii Butter, Squalane, Certyl Alcohol, Zincoxid, Pinus Pinaster Bark/Bud Extract, ubiquinone, Dimethicone, Ethylhexylglycerin, Pottassium Sorbate, Parfum, Phenoxyethanol, Tocopherol, Xanthangum. Suitable for all skin types and may be applied under makeup. Below are reviews of Q10 Revitalizing Day Cream - 50ml by bodykind customers. If you have tried this product we'd love to hear what you think so please leave a review.